Game Sunday, November 11, 2018. Game starts at 1:00 pm. I suggest you get there first thing if you want to park right next to the action. The lot doesn’t fill up very quickly so if you aren’t there first thing, you probably won’t be too far away. We are going to park in lot 27, near pole “A”. This lot is an orange parking pass lot. Google “lot 27 Met Life” for directions if driving in. For walkers used to lot 26, pass in front of the old IZOD center, progress to crosswalk, it is straight ahead. Three of the last six road trip events I have been a part of have been shut down by the police. Stadium’s are becoming intolerant to large masses of fans assembling, leaving a giant messes, and engaging in shenanigans (think table crashing). What happens is a group of 2 or 3 will wander in with a 18 or 24 pack and a bag of munchies. When they leave there are 18 or 28 empty cans and empty bags of munchies scattered on the ground where whey were standing. Multiple this by several hundred and we have a huge problem. In the past few years, Pinto crew members have stayed late (usually half the first quarter) to at least beat the mess down to a more manageable level to avoid being banned the next year. We are not doing that this year. This will be my 400th consecutive game and I don’t plan on missing any of it picking up garbage. We are providing garbage bags, and there are dumpsters to place trash in (or near). This is not too much to ask, don’t get us chased out of here next year! This is last tailgating lot on this side of the stadium, and one of the last lots at the lowest parking costs. Plenty of people take public transportation: http://www.metlifestadium.com/getting-here/directions. EVERYONE is invited. No extra fees to attend tailgate. If you are driving, a parking pass/ticket is needed. If you are not driving, you can still attend. Food and drinks are bring your own. Do you need to bring a grill (or other cooking equipment)? There are others with them. I’m sure they would share space, but I would highly recommend either bringing your own or sandwich type foods. Unfortunately the group tickets have been sold out. Your best bet is StubHub or Ticketmaster. A few years back, the lot was left an utter disaster. Jets/NFL security wasn’t happy. Be respectful. Yes the Meadowlands was built on a garbage dump, but lets not add more garbage on top. All kidding aside, we need to be respectful. We need a volunteer to bring garbage bags. Ken “Pinto Ron” Johnson is the man responsible for starting this tailgate, lets not mess up his reputation. He’s a legend. Is MetLife safe for Bills fans? My personal experience is yes absolutely. Yes there will be some trash talking, but nothing too bad. Like any place in the world, it almost always takes 2 to escalate. Will there be a TV to watch the game? Most likely not. McFadden’s and Calicos will still have the game on. If a group of more than 8 is needed, please call Tom Giulietti with the NY Jets, 973–549–4872. Mention the NYCBBB! Just a quick update/heads up. The bars will only play the preseason games that air live on the NFL Network. Tonight’s game, unfortunately, won’t be shown at the bars. We’ll send out an update about the rest of the preseason games very soon. I want to give a big thank you to Steve Saslow and the staff at BillsDaily.com for all the years of hard work and dedication. They’ve decided to shut down the site. This has been my one an only go to site for Bills news for the last 20 years. While not the prettiest looking site, it gave me every bit of info on one page. I think their genius was in their ability to summarize EVERYTHING going on with the team (news, depth chart, injuries, front office/free agents) in as concise of a manner possible. I will miss it dearly. Thank you again Steve! We just wanted to let everyone know that McFadden’s will be putting on a Super Bowl party for Bills fans. Bills fans get $10 off their $40 beer and wing package. There will be room in the back bar set aside just for Bills fans. They will also have tables available for reservations in the dining room if you prefer. For table reservations, please call Hollie at 212-986-1515. The package includes all draft beer from 5:30pm until the end of the Super Bowl. The package also includes 50 cent wings. Must order minimum of 10 wings per order. 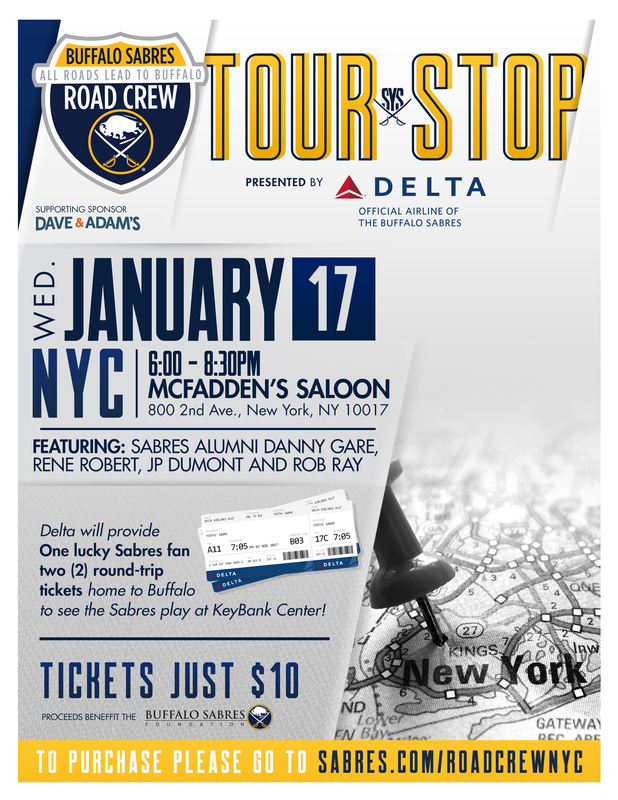 The Sabres reached out to us and their Road Crew will be hitting McFadden’s on 1/17 in advance of the game against the Rangers the next day. Tickets to the Road Crew party are $10. Danny Gare, Rene Robert, JP Dumont, and Rob Ray will be on hand! Bills at Jets / Tailgate on November 2, Get Tickets Now! Speaking of AFC East, the Jets are offering us group rates again. Tickets either $65 or $45. Don’t forget parking ticket if driving!